Technology touches our daily lives more than we might understand. Technology evolves rapidly and it seems to be easier to create technology based innovations without a clear need. Thus the technical breakthrough is made first and the business is build around it. Seems like the ethical side of the modern products — such as social media — are not thought at all. Let’s take a look what kind of role ethics and technology plays in our everyday lives. Algorithms play a huge role in modern digital product development. What is an algorithm? In layman’s terms: algorithm has an input and output, and the output is defined by set of rules. Algorithms help to automate tedious tasks or run functions behind the scenes to simplify the user experience from the user point of view. For example very trendy Artificial Intelligence (AI) is a highly complex algorithm that has an ability to adapt and learn. AI is closely related to another buzz word — big data — because AI uses that for learning. Pretty cool, right? What could possibly go wrong? 🤷 Well, we have already seen some cases where the creators have lost control of the AI. For example Microsoft’s Twitter bot — Tay — went from innocent and loving to maniac racistin less than 24 hours. 😬 After this incident, dystopias like Matrix and Skynet don’t feel so distant anymore. This raises a lot of concerns and questions. 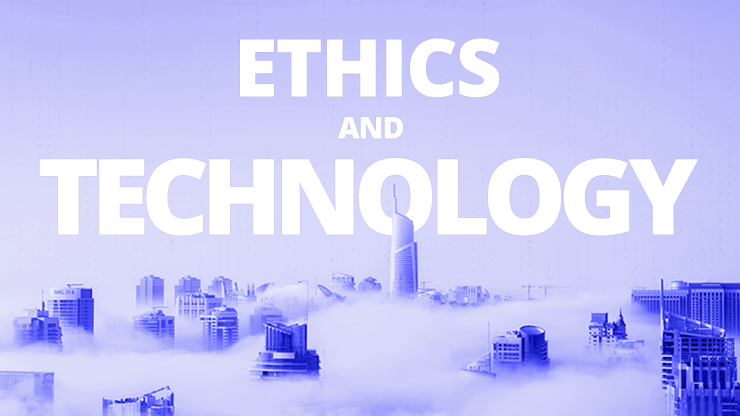 I believe ethics will start to play a bigger role in the design and technology industry in near future. We need to start questioning: “If we can technically do something, does it mean we should do it?” Same thing happened in the mid-nineties when Dolly “the sheep” was cloned in Scotland. People immediately started to talk about the ethics of cloning. Laws and regulations were set worldwide to control human cloning. I hope technology industry doesn’t need to go this far. However, with great power… comes great responsibility. Social media platforms are excellent for spreading racist hate talk and fake news. The fake news are dangerous problem because these platforms reach so many people. Facebook alone attracts over two billion active users around the world. Donald Trump is famous for stating that all the news that he doesn’t like are “fake news”. Now advertisement and digital agencies are exploiting this trend by creating “clever” campaigns across the social media blurring the line between advertisements and news. There’s clearly a flaw in the algorithms that were created to engage — or should I say — enslave us. The weight given to views, likes and shares are easy to manipulate by “bad actors” and bots. It also seems that there are a new breed of young entrepreneurs that are ruthless on optimizing engagement and conversion. We are already creating dangerously addicting games and services. In some point we should — once again — start focusing on the user experience rather than just creating addiction. I think it’s our responsibility as designers and developers to create positive feelings to the user rather than negative, like addiction. Personally, I want to see products and services that uses innovation to improve or simplify my everyday life. Facebook, Google and other social media platforms make their money from advertising. As with all ad-supported businesses, that means advertisers are the true customers, while audience members are the product. This is an interesting point of view. The set up is typically vice versa: the user uses the product. Here’s a rule of thumb: if you’re not paying for the product, you are the product. In the near future, application and software creators have to start paying more attention to the ethical side of the business. Currently, the service providers are running psychological experiments with the users to define how to increase the engagement and maximize the conversion. It seems like the industry has totally forgotten the user experience. Comment how do you think technology is impacting our lives and how do you see the future, is it a bright utopia or a dark dystopia?